We show you the weather now as well as today’s weather in Alicante, the latest current temperature in Alicante and the conditions in Alicante i.e. sun, cloud, rain, overcast, clear, etc as well the humidity, pressure, wind direction and wind gust strength. You can click on the graphic and get a much more detailed weather outlook including: tomorrow’s weather in Alicante, long range forecast, a weather map showing any pressure systems, visibility, UV, pollen count, dew point, where the weather station providing this data is located, a 5 day, 7 day (week forecast), 14 day, 15 day and 10 day forecast for Alicante weather. The city of Alicante on Spain’s Costa Blanca enjoys hot summer weather and mild winters making this an ideal climate for this huge tourist destination with people visiting Alicante from all over Europe. 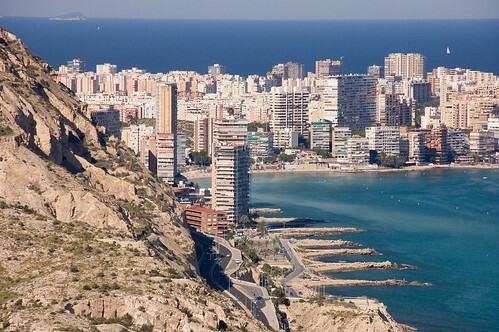 Many people fly into Alicante Airport which is the gateway to the rest of the Costa Blanca but Alicante itself has great sandy beaches which are popular all year-round. There is little rainfall as Alicante is protected by hills and mountains. The weather and climate in Alicante is excellent. Alicante basks in more than 2,800 hours of sunshine each year with an average annual temperature of 19.3 degrees Celsius. Because the Alicante weather and climate is so favourable, Alicante has become a popular tourist destination for sun lovers enjoying approximately 325 sunny days each year. Many people are also choosing to live in Alicante due to the excellent all-year round weather conditions. This page gives you information on all aspects of the weather conditions in Alicante weather. We have a description of Alicante’s climate, we have today’s weather, we have up-to-the-minute current weather temperature for Alicante as well as a more detailed 10 day forecasts for the weather in Alicante. The weather in summer in Alicante is typically very hot with little to no rainfall. Summer temperatures in Alicante will mostly be between 25 degrees Celsius to 35 degrees Celsius during the day. Temperatures at night in the summer in Alicante rarely drop below 15 degrees Celsius. Because Alicante’s humidity is low you won’t feel the temperature is as high as it really is. Do take precautions and keep out of the sun between 12 o’clock and 3 o’clock. Always wear a high sun cream factor especially if you are on Alicante’s beaches. Fortunately on most days you will most likely have cooling sea breezes. If you are renting or hiring a villa or apartment in Alicante in the summer you may well want to look to rent a villa or apartment with air conditioning or at least one with fans otherwise you may have trouble sleeping at night, especially if you are coming on holiday from a northern European country where the temperatures are much lower. The average temperature for June in Alicante is 23 degrees Celsius. Typical June weather in Alicante is excellent as the days are sunny yet not too hot (compared to July and August). To dress for the June weather bring T-shirts and shorts and perhaps a light top for evening wear. The sea temperature in June for Alicante is a nice warm swimmable 20 degrees Celsius. 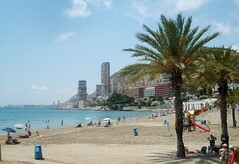 Perhaps the best month to visit Alicante as July has the most sunshine hours and the least rainfall of the whole year. The average temperature for July in Alicante is a very hot 26 degrees Celsius. 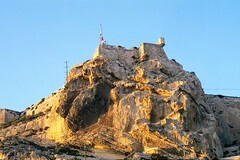 Typical July weather in Alicante is clear and sunny days and warm to hot evenings and virtually no rainfall. To dress for the July weather bring lots of T-shirts and shorts. The sea temperature in July for Alicante is a very warm swimmable 24 degrees Celsius. In August Alicante weather can be almost unbearably hot with some days reaching 40 degrees Celsius or more. The average monthly temperature for August in Alicante is a very hot 27 degrees Celsius. Typical August weather in Alicante is clear and sunny with no rainfall and hot evenings. To dress for the August weather bring lots of T-shirts and shorts, you would feel uncomfortable wearing long trousers it is so hot in August. The sea temperature in August for Alicante is a very hot 25 degrees Celsius. The autumn is a good time to visit Alicante and the rest of the Costa Blanca because the autumn weather is usually mild and sunny with some days being very hot although evenings can be cool. There is a chance of some rainfall. The Mediterranean Sea remains warm and you can still swim well into October. In the autumn there are likely to be the occasional electrical thunderstorms with lightning and torrential rainfall sometimes resulting in flooding. In September Alicante weather is excellent because many of the tourists have left yet temperatures are still high with an average monthly temperature of 24 degrees Celsius. Typical September weather in Alicante is clear and sunny with perhaps some rainfall in the form of brief showers. To dress for the September weather generally it is still T-shirts and shorts although bring some jeans and long trousers just in case for the evenings. The sea temperature in September for Alicante is a very nice 24 degrees Celsius, perfect for swimming. In October Alicante weather is often warm and sunny with an average monthly temperature dropping down to 21 degrees Celsius. For rainfall October is usually the wettest month for Alicante. To dress for the October weather in Alicante bring a mixture of T-shirts, shorts, jumpers, jeans and long trousers to cover all possible conditions. The sea temperature in October for Alicante is 21 degrees Celsius which for most people is still warm enough to swim. In November Alicante weather is changeable but often fairly warm and usually sunny with an average monthly temperature of 15 degrees Celsius although there is always a chance of rainfall. To dress for the November weather in Alicante bring a mixture of T-shirts, shorts, jumpers, jeans and long trousers to cover all possible conditions. The average sea temperature in November for Alicante is 18 degrees Celsius which is at a point where most people wouldn’t swim. The weather in Alicante in winter is very mild compared to northern Europe. Most winter days in Alicante are clear and sunny with little rainfall. The temperatures are unpredictable and can vary greatly in winter however, one day it can be over 20 degrees Celsius and you will be walking around in your t-shirt, on another day it can be 6 degrees Celsius and feel very cold. If you are visiting Alicante in winter be careful to ensure that if you rent a villa or apartment that it has some form of heating, preferably central heating. Even in the winter it doesn’t rain much in Alicante with the exception being when Alicante experiences a ‘Gota Fria’ – this happens when the temperature suddenly drops resulting in incredible torrential rain and flooding. The Gota Fria also creates huge waves and high tides which often destroys Alicante’s beaches. In December Alicante weather is changeable, sometimes warm but often cool during the daytime with an average monthly temperature of 12 degrees Celsius. There is little rainfall in December but nights are cold. To dress for the December weather in Alicante bring warm clothing such as jeans, jumpers, coat and long trousers. The average sea temperature in December for Alicante is 15 degrees Celsius and too cold for most people to consider swimming. In January Alicante weather is usually cold, although sometimes mild with an average monthly temperature of 11 degrees Celsius. There is little rainfall in January but nights are cold and sometimes near freezing point. To dress for the January weather in Alicante bring warm clothing such as jeans, jumpers, coat and long trousers. The average sea temperature in January for Alicante is 14 degrees Celsius and too cold for most people to consider swimming. In February Alicante weather is usually cold, although sometimes mild to warm with an average monthly temperature of 12 degrees Celsius. The chance of rainfall increases in February and nights are cold. To dress for the February weather in Alicante bring warm clothing such as jeans, jumpers, coat and long trousers. The average sea temperature in February for Alicante is 14 degrees Celsius and too cold for most people to consider swimming. Alicante’s weather and climate in Spring picks up especially after March when the beaches begin to become popular once more. There is a chance of rainfall but the days are often clear and sunny although evenings can still be quite cool until we get into May. Sea temperatures remain cold until May when they start to climb rapidly. In March Alicante weather is usually mild with many nice sunny days with an average monthly temperature of 14 degrees Celsius. The chance of rainfall is still fairly high and nights are still cold. To dress for the March weather in Alicante bring warm clothing such as jeans, jumpers, coat and long trousers as well as some T-shirts. The average sea temperature in March for Alicante is 14 degrees Celsius and too cold for most people to consider swimming. In April Alicante weather is usually heating up rapidly with many nice warm sunny days with an average monthly temperature of 16 degrees Celsius. The chance of rainfall decreases although nights are still cool. To dress for the April weather in Alicante bring a mixture of warm clothing such as jeans, jumpers and long trousers as well as some T-shirts and shorts. The average sea temperature in April for Alicante is 15 degrees Celsius and still too cold for most people to consider swimming. In May Alicante weather is superb with many hot and sunny days with a very pleasant average monthly temperature of 20 degrees Celsius. Expect fairly little chance of rainfall, nights are now warm. To dress for the May weather in Alicante bring mostly summer clothing such as T-shirts and shorts with some warm clothing just in case such as jeans, a jumper and long trousers. The average sea temperature in May for Alicante is 17 degrees Celsius which see many people start to venture into the sea to swim. 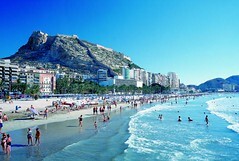 Alicante is situated on the Costa Blanca and The World Health Organisation describes the climate of the Costa Blanca as one of being the best in the world. Alicante’s summers are hot but not too hot due to the cooling breezes and the winters in Alicante are mild with many clear blue sunny days. Alicante’s climate and weather is very healthy especially for sufferers of arthritis. Many people are confused as to the difference between weather and climate. We can describe the climate and temperature in Alicante as being based on long-term measurement of the weather with satellites, radar, charts and other meteorological equipment. This gives a typical idea of what the conditions of Alicante will be for certain times of the year. The weather however is a short-term snapshot and each day can be completely different. Reading this section on the climate of Alicante gives you an idea of what you should expect each season and month to be like when visiting Alicante, Costa Blanca, Spain.